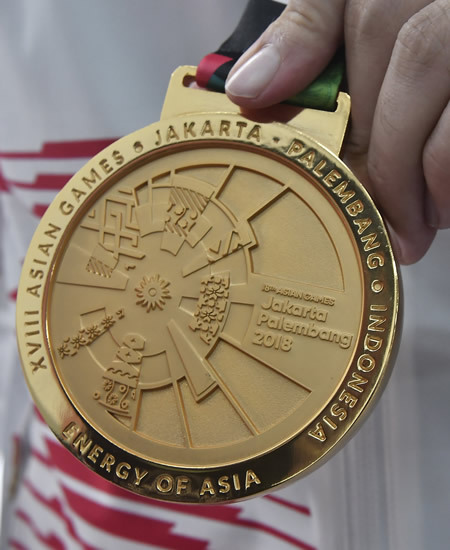 Photo: A winner displays his Gold Medal won at the Asian Games 2018, Jakarta, Indonesia. ANTARA FOTO/INASGOC/Sutanta Aditya/thv/18. 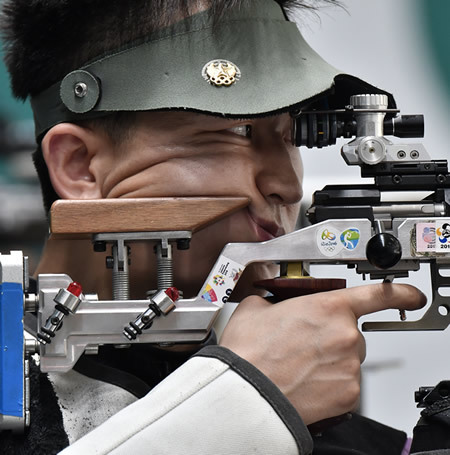 Photo: Chinese shooter, Hui Zicheng, aims at the target during the final round of shooting in the 50m Air Rifle in the shooting arena of Jakabaring Sports City (JSC), Palembang, South Sumatra, Indonesia, Tuesday, August 21, 2018. ANTARA FOTO/INASGOC/Sutanta Aditya/thv/18. 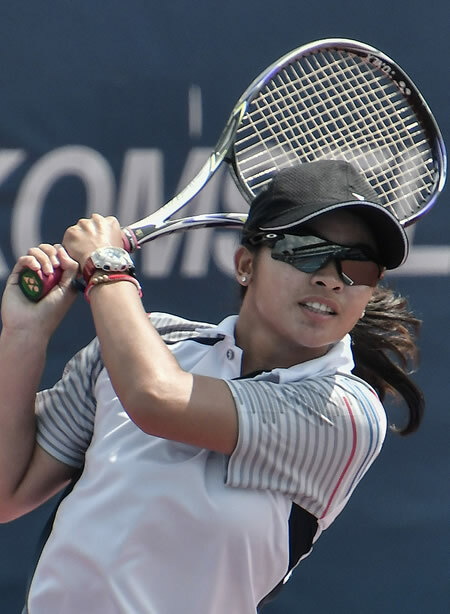 Photo: Thailand Lawn Tennis Player, Sirungreang, returns the ball in the Asian Games 2018 women’s lawn tennis qualifying round in Jakabaring Sports City, Palembang, South Sumatra, Indonesia, Friday, August 31, 2018. ANTARA FOTO/INASGOC/Hendra Nurdiyansyah/nym/18. 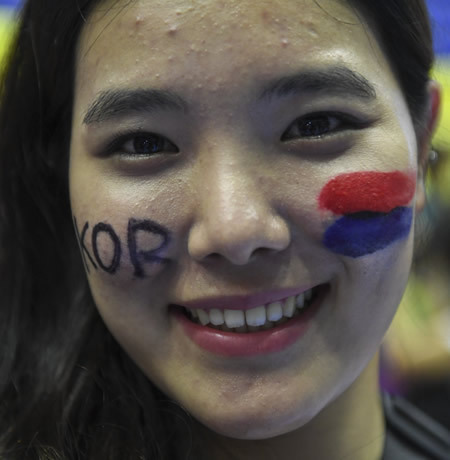 Photo: A supporter of the South Korean team poses after the South Korean handball team defeated the Chinese team in the final in the 2018 Asian Games at GOR Popki, Cibubur, Jakarta, Thursday, August 30, 2018. ANTARA FOTO/INASGOC/Fulli Syafi/mes/18. Photo: Vietnamese athlete, Vu Thi Men, participates in the Women’s Triple Jump Final of the 2018 Asian Games at the Bung Karno Main Stadium, Senayan, Jakarta, Thursday, August 30, 2018. ANTARA FOTO/INASGOC/M Agung Rajasa/mes/18. 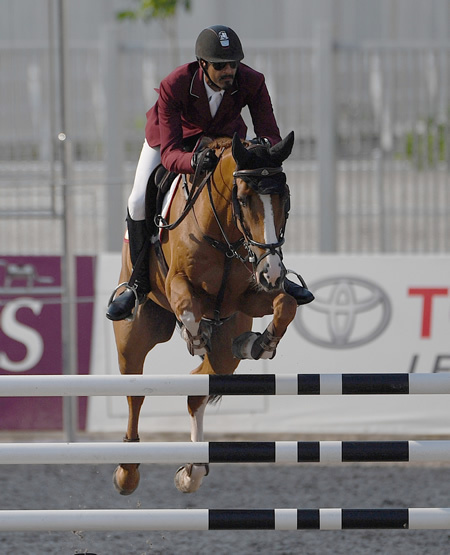 Photo: Qatar equestrian athlete, Ali Althani, jumps obstacles in the individual Asian Games 2018 jumping final, at the Jakarta International Equestrian Park, Pulomas, Jakarta, Thursday, August 30, 2018. ANTARA FOTO/INASGOC/Melvinas Priananda/tom/18. 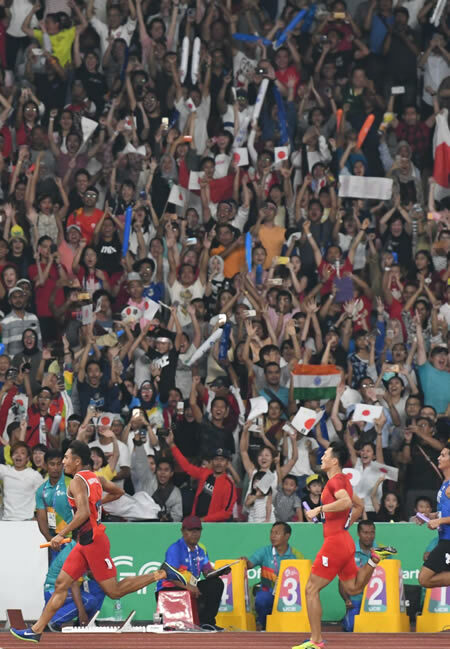 Photo: Indonesian runner, Bayu Kertanegara (left) touches the finish line in the final round of the 2018 Asian Games Men’s 4x100m Relay Run at the Gelora Bung Karno Main Stadium Senayan, Jakarta, Thursday, August 30, 2018. ANTARA FOTO/INASGOC/Andika Wahyu/mes/18. 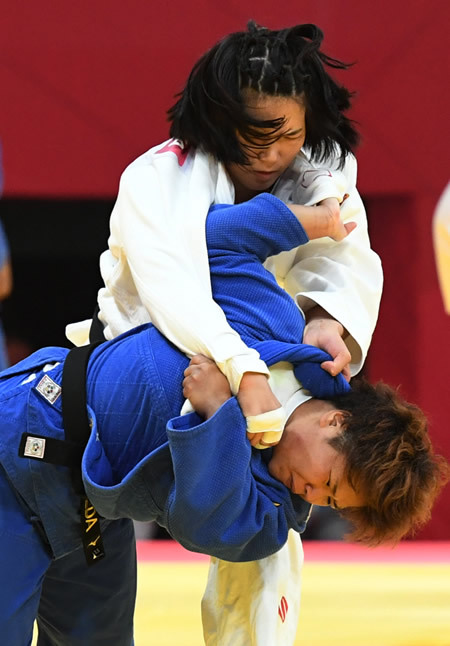 Photo: Thailand judo player, Ikumi Oeda (below), plays against Chinese judo player, Zhenzhao Ma (above), in the women’s class -78 kilograms quarter-finals of the 2018 Asian Games judo competition at the JCC, Plenary Hall, Jakarta, Indonesia, Friday, August 31, 2018. ANTARA FOTO/INASGOC/Bram Selo Agung/MTG/18. Photo: Hong Kong player, Wong (right,) competes for the ball with Kazakh player, Domashneva, while competing in the women’s hockey in the 2018 Asian Games at Hoki Square, Bung Karno Complex, Jakarta, Friday, August 31, 2018. Hong Kong won 2-0 over Kazakhstan. ANTARA FOTO/INASGOC/Dhoni Setiawan/pras/18. Photo: Rollerskaters compete in the 20 km speed event of the 2018 Asian Games at Arena Roller Skate Kompleks Jakabaring Sports City, Palembang, South Sumatra, Indonesia, Friday, August 31, 2018. ANTARA FOTO/INASGOC/Ahmad Rizki Prabu/thv/18. 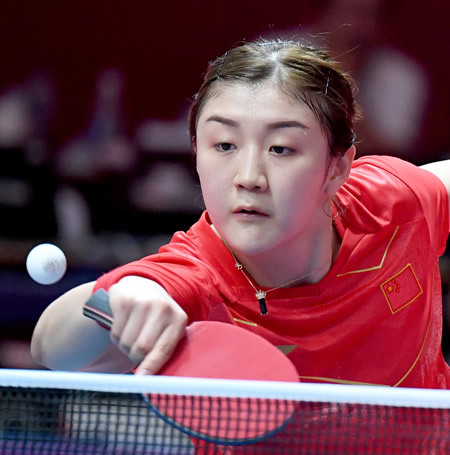 Photo: Chinese table tennis player, Chen Meng, returns the ball in the final of the 2018 Asian Games individual women’s singles competition at JIExpo Kemayoran, Jakarta, Indonesia, on Saturday, September 1, 2018. ANTARA FOTO/INASGOC/Hermanus Prihatna/ang/18. Photo: Chinese Lawn Tennis Player, Yu Yuanyi, returns the ball in the Women’s Lawn Tennis Semifinal match of the 2018 Asian Games at JSC Tennis Courts, Palembang, South Sumatra, Indonesia, on Saturday, September 1, 2018. ANTARA FOTO/INASGOC/M N Kanwa/nym/18.